The Neem tree is recognized as Sarva Roga Nivarini in Sanskrit in India, it means "The curer of all diseases". It has anti-fungal, anti-inflammatory, anti parasitic, antiviral, antibacterial and antiseptic properties. The blood purifying and anti-bacterial properties of neem make it the best homemade skin care whereas antimicrobial and immune-boosting properties make it the best homemade hair care product. This incredible bitter tree can treat skin conditions like eczema, acne, chicken pox, ringworm, etc. and hair problems such as head lice, premature graying, dandruff, hairloss, dry & itching scalp, etc. Neem is very easy to use and has no side effects. Boil 10 neem leaves and orange peel in a little water till they mix well and become pulp. After that, make a smooth paste by adding some honey, yoghurt and soy milk. Apply this to the whole face three times a week to clear acne and pull out blackheads. Make a pack of neem leaves’ paste and turmeric and apply on your face. Use this remedy daily for 3 months. Add one cup of neem leaves in boiling water and boil till the water turns green. Sieve the solution and store in a bottle. Add the boiled neem water in your regular bathing water. Apply the paste of crushed fresh neem leaves to the face. As it begins to dry, rinse it with water. Take neem powder and add lemon juice & yoghurt. Apply this neem-yoghurt pack to control excessive oil secretion on your face. Make a neem-rose petal face pack by mixing neem powder with rose petal powder, milk and yoghurt. Apply it on the face and neck, and wash it off with rose or cold water after 15 minutes. Combine a few drops of grapeseed oil, neem powder & water and create a paste. Apply it on the face and wash after few minutes with cold water. It will prevent excessive dryness. Take neem leaves' powder, and add one tsp of tulsi powder and rose water. Apply the paste on your face and wait for 30 minutes. Wash it with plain water. Crush cucumber and some neem leaves to form fine paste. Then, add a pinch of turmeric powder and water. Apply on the face and wash after 30 minutes with water. Apply the paste of pure neem leaf powder and water to the affected area. You can also add turmeric powder. Add a cup of neem leaves in boiling water and boil till the water becomes green. Strain the water with a strainer. Dip a cotton ball in the solution and wipe your face with it every night. It will fight the signs of aging also lighten the acne scars. Apply a paste made from dried neem leaves powder and orange & pomegranate peel powder on the body for moisturizing the body naturally. Face cleanser can be made by mixing sesame oil (10 drops), coconut oil (10 drops), neem oil (5 drops) and lemon oil (5 drops). Store this oil mixture in a bottle. Use the mixture for cleansing after adding 6 drops of water. It will also treat dry skin. Take mint, tulsi, coriander and neem leaves in equal quantities. Make a paste and apply on the face. Wait for 20 minutes and wash off with plain water. Simply apply the neem oil on the affected area. Add 1 to 2 drops of lemon juice in some mashed neem leaves. Apply the mixture on the face and neck and wash it off after 15 minutes with cold water. Mix neem oil (10%) and coconut or sesame oil (90%). Massage this oil into hair & scalp and leave it on for the whole night. In the next morning, shampoo as usual. Make a hair pack by combining neem powder, shikakai (acacia concinna) and amla (Indian Gooseberry) in water. Apply this pack on head and keep for 45 minutes. Rinse with water. Boil a cup of fresh neem leaves with water and use it to rinse the hair after shampooing. Strain the water before using it. You can even use this boiled neem water for dandruff and hair fall. Grind curry leaves (1 hand), neem leaves (10 no. ), black jamun leaves (10 no. ), coriandar leaves (2 hands full) and lemon juice (2 tsp) together then strain it. Consume the juice once a week. Apply the paste of neem powder on your scalp by massaging and leave it for 1 hour. Then, shampoo your hair. Massage neem oil on your hair & scalp once or twice a week. After massaging, shampoo the hair with a neem based shampoo. 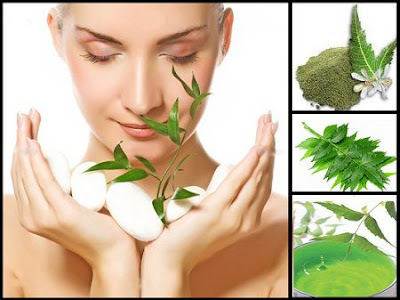 Neem is known as a village pharmacy as it is a natural remedy and most of the people are depending on Neem for natural, healthy and glowing skin.